Eurasian watermilfoil was discovered in Lake Minnetonka in 1987 – the first lake in Minnesota to have milfoil. Within a couple years, the pesky plant spread throughout the lake and has been problematic since that time – I estimate there are up to 5,000 acres of milfoil in Lake Minnetonka. Given the scope, duration and impact of milfoil on Lake Minnetonka, it is surprising to me there has never been a comprehensive inventory of milfoil nor has there ever been a comprehensive management plan for milfoil. The harvesting program is designed to facilitate access and navigation, but not to control milfoil in the lake. The harvesting program cuts and removes about 300 acres of milfoil per season. Weevils are native to Minnesota (and are in Lake Minnetonka) and grow on milfoil. It was hoped the weevils, if enhanced, would provide a biological control for milfoil. The weevil research of the University of Minnesota (as well as similar research around the country) did not result in any practical or operational control program, despite the expenditure of over $1,000,000. Unfortunately, sufficient weevil densities could neither be attained nor sustained - and it was discovered that bluegills preyed upon the weevils. The LMCD’s AIS Task Force has determined that weevils do not represent a viable control method for milfoil. The 2006 demonstration project evaluated ‘selective’ herbicides in three test areas. Here, ‘selective’ refers to the ability of the herbicide product to selectively target and kill milfoil while doing minimal harm to native plants. On the basis of the positive results, the larger-scale milfoil control project was initiated. In 2007, a Lake Vegetation Management Plan was developed to frame a milfoil control milfoil in three bays (Carmans, Grays and Phelps). The expert panel concluded that the use of selective herbicides was the only feasibly method to control milfoil and protect native plants. This project was begun in 2008 and will continue through 2012. This year, Gideon and St. Albans Bays will be added to the herbicide project. The Lake Minnetonka Association supports the herbicide project and believes it should be an element of a long-term, comprehensive management plan for milfoil in Lake Minnetonka. The agencies responsible for managing milfoil on Lake Minnetonka must now take advantage of the recent knowledge gained and the high level of community interest and initiate the development of a milfoil management plan for all of Lake Minnetonka to be implemented by 2013. We have learned that private funding for controlling milfoil can be an element of this plan. However, the funding model we have developed through the milfoil control program on five bays relies too heavily on private funding, which we believe is not sustainable in the long run. 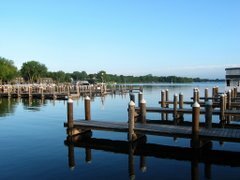 Further, Lake Minnetonka is a public resource, therefore a reliable source of public funding ought to provide the majority of support for milfoil management. The Lake Minnetonka Association is gratified the milfoil control program on the five bays has been supported by individuals, businesses and governmental agencies. We think this positive energy should now be focused on the development of a long-term milfoil management plan and program for all of Lake Minnetonka. Invasive plants are such a hassle. They are so difficult to get rid of it. I hope that at Lake Minnetonka they are eventually able to get rid of the milfoil and restore it back to its natural condition. The lake is still very beautiful, at least.